Coronary artery disease (CAD) is very common and leads to the narrowing of the vessels supplying blood to the heart (called the coronary arteries) as a result of a build-up of fatty deposits (atherosclerotic plaques) within the walls of the arteries. When this disease is extensive, coronary artery bypass graft (CABG) surgery may be needed. Fatty tissue (called adipose tissue) is thought to be a biochemical factory with an important role in the formation of atherosclerotic plaques. However, the exact mechanisms by which the fat tissue interacts with the blood vessel wall and heart muscle and how it changes their biological behaviour are still unclear. We are investigating the mechanisms by which the fat tissue, the vessel walls and the heart muscle interact and we aim to explore whether aspects of this interaction can predict the outcomes of coronary artery bypass grafting operation (CABG). Many different laboratory techniques will be used to analyse the samples collected from participants which will include current established techniques as well as newly developed techniques that become available during the course of the study. The success of bypass graft surgery will be further assessed in participants undergoing CABG using Computed Tomography Angiogram (CT-A) to determine if the flow through the graft is normal (the vein graft patency). 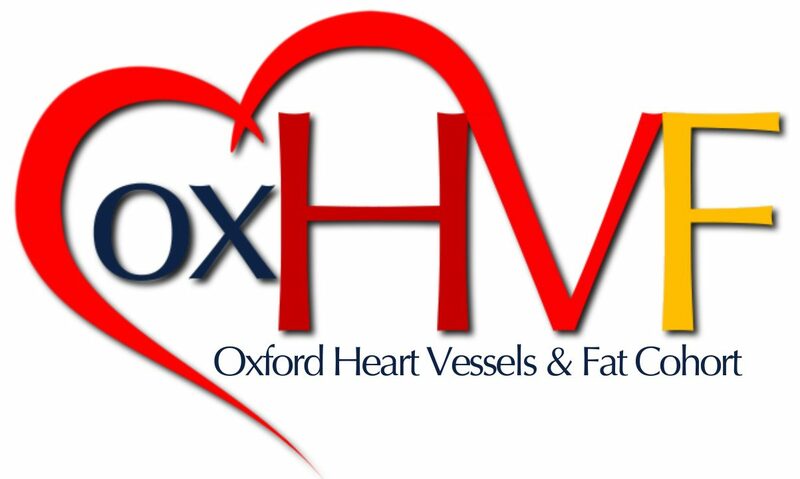 This study is part of the Oxford Heart Vessels Fat (Ox-HVF) cohort, which consists of a cluster of clinical studies (namely ART Vascular, Bypass Grafts, AdipoRedOx, ORFAN and IMPACT), which provide results allowing the deployment of a multi-level strategy to understand the mechanisms of cardiovascular diseases. As each one of the individual studies approaches the issue of cardiovascular disease pathogenesis from a different angle, the OX-HVF cohort provides a unique and powerful platform and the strength of the cohort is the direct access to human tissue (vessels, myocardial and fat biopsies, DNA, plasma and others), in combination with extensive non-invasive cardiovascular phenotyping that includes cardiovascular computed tomography angiography, ultrasound and others. The OX-HVF cohort also collects prospective 10-year clinical outcome data and is linked to the NIHR Bioresource. Combination of anonymised research data obtained from any study under the OX-HVF cohort will add value to the research results and potentially allow the translation of the findings into clinical applications. This study is aiming to recruit 700 participants undergoing coronary artery bypass graft surgery (CABG) and 300 undergoing heart valve repair/replacement surgery. Inclusion of patients who do not have CAD is equally important as it will allow us to check if the research findings observed in CABG patients are indeed related to the underlying CAD, rather than the effect of heart surgery alone. The study is actively recruiting until 2020 and will follow participants up until 2030. As part of our PPI (Patient and Public Involvement) initiative participants are able to review study documents and give feedback on how to improve future ethically approved clinical studies. CAD and non-CAD patients aged 18 and over who are scheduled to have heart surgery at the John Radcliffe Hospital will be invited to take part in the AdipoRedOx study. All potential participants receive details about the study in the form of a Participant Information Sheet. For individuals who wish to take part in the study, written and informed consent is obtained prior to enrolment to the study. All participants undergo an hour of non-invasive ultrasound assessments in the patient’s ward room the evening before surgery. During the routine CABG operation, the cardiac surgeon will collect a small piece of fat from around the heart, a small sample of heart tissue that is excised as part of the operation, a sample of vein that would normally be discarded and 50 ml of blood. 3 days after surgery a further blood sample (20 ml) may be obtained. Participants will be called every two years for up to ten years after surgery to answer a health questionnaire over the telephone. Participants undergoing CABG surgery are invited back for a follow up CT angiogram around 6 weeks after surgery to assess their bypass grafts. Full details can be found in the AdipoRedOx Participant Information Sheet. Throughout the duration of the study, participants will have their medical records examined through accessing data from a number of NHS systems for outcome data and hospital episode statistics. This additional data will provide the study with valuable information on events that happen not only in the recruiting hospital but also in hospitals across the UK. Prof C Antoniades (CI)1, Prof Keith M Channon1, Prof Barbara Casadei1, Prof Robin Choudhury1, Mr Rana Sayeed2, Mr Mario Petrou2, Mr Ravi De Silva2, Mr George Krasopoulos2, Dr Regent Lee2, Dr Alexis Antonopoulos1, Dr Marios Margaritis1, Dr Evangelos Oikonomou1, Miss Laura Herdman1, Miss Sheena Thomas1, Dr Ioannis Akoumianakis1, Miss Akansha Tarun1, Dr Nikant Sabharwal2, Dr Andrew Kelion2, Dr Cheerag Shirodaria2, Dr Andrew Mitchell3, Dr Attila Kardos4, Dr Raman Uberoi2, Dr Suzan Anthony2 and Prof Stefan Neubauer1. This study is supported by the British Heart Foundation, National Institute of Health Research-Oxford Biomedical Research Centre, the European Commission FP7 and H2020, the Medical Research Council and the European Society of Cardiology. South-Central, Oxford C Research Ethics Committee has reviewed and approved the study reference MREC 11/SC/0140). Current document version 1.0 Nov 2016. Antonopoulos AS, Margaritis M, Verheule S, Recalde A, Sanna F, Herdman L, Psarros C, Nasrallah H, Coutinho P, Akoumianakis I, Brewer AC, Sayeed R, Krasopoulos G, Petrou M, Tarun A, Tousoulis D, Shah AM, Casadei B, Channon KM and Antoniades C. Mutual Regulation of Epicardial Adipose Tissue and Myocardial Redox State by PPAR-gamma/Adiponectin Signalling. Circ Res. 2016;118:842-55. Karimi Galougahi K, Antoniades C, Nicholls SJ, Channon KM and Figtree GA. Redox biomarkers in cardiovascular medicine. Eur Heart J. 2015;36:1576-82, 1582a-b. Antonopoulos AS, Margaritis M, Coutinho P, Shirodaria C, Psarros C, Herdman L, Sanna F, De Silva R, Petrou M, Sayeed R, Krasopoulos G, Lee R, Digby J, Reilly S, Bakogiannis C, Tousoulis D, Kessler B, Casadei B, Channon KM and Antoniades C. Adiponectin as a link between type 2 diabetes and vascular NADPH oxidase activity in the human arterial wall: the regulatory role of perivascular adipose tissue. Diabetes. 2015;64:2207-19. Antonopoulos AS, Margaritis M, Coutinho P, Digby J, Patel R, Psarros C, Ntusi N, Karamitsos TD, Lee R, De Silva R, Petrou M, Sayeed R, Demosthenous M, Bakogiannis C, Wordsworth PB, Tousoulis D, Neubauer S, Channon KM and Antoniades C. Reciprocal effects of systemic inflammation and brain natriuretic peptide on adiponectin biosynthesis in adipose tissue of patients with ischemic heart disease. Arterioscler Thromb Vasc Biol. 2014;34:2151-9. Antoniades C and Channon KM. Statins: pleiotropic regulators of cardiovascular redox state. Antioxid Redox Signal. 2014;20:1195-7. Margaritis M, Channon KM and Antoniades C. Statins as regulators of redox state in the vascular endothelium: beyond lipid lowering. Antioxid Redox Signal. 2014;20:1198-215. Margaritis M, Antonopoulos AS, Digby J, Lee R, Reilly S, Coutinho P, Shirodaria C, Sayeed R, Petrou M, De Silva R, Jalilzadeh S, Demosthenous M, Bakogiannis C, Tousoulis D, Stefanadis C, Choudhury RP, Casadei B, Channon KM and Antoniades C. Interactions between vascular wall and perivascular adipose tissue reveal novel roles for adiponectin in the regulation of endothelial nitric oxide synthase function in human vessels. Circulation. 2013;127:2209-21. Lee R, Antonopoulos AS, Alexopoulou Z, Margaritis M, Kharbanda RK, Choudhury RP, Antoniades C and Channon KM. Artifactual elevation of plasma sCD40L by residual platelets in patients with coronary artery disease. Int J Cardiol. 2013;168:1648-50. Lee R, Adlam D, Antoniades C, Digby JE, Kharbanda RK, Choudhury RP and Channon KM. Heparin administration leads to rapid decrease in plasma matrix metalloproteinase-9. Int J Cardiol. 2013;163:212-3. Lee R, Margaritis M, Channon KM and Antoniades C. Evaluating oxidative stress in human cardiovascular disease: methodological aspects and considerations. Curr Med Chem. 2012;19:2504-20. Cerrato R, Cunnington C, Crabtree MJ, Antoniades C, Pernow J, Channon KM and Bohm F. Endothelin-1 increases superoxide production in human coronary artery bypass grafts. Life Sci. 2012;91:723-8. Antonopoulos AS, Margaritis M, Lee R, Channon K and Antoniades C. Statins as anti-inflammatory agents in atherogenesis: molecular mechanisms and lessons from the recent clinical trials. Curr Pharm Des. 2012;18:1519-30. Margaritis M, Channon KM and Antoniades C. Statins and vein graft failure in coronary bypass surgery. Curr Opin Pharmacol. 2012;12:172-80. Cunnington C, Van Assche T, Shirodaria C, Kylintireas I, Lindsay AC, Lee JM, Antoniades C, Margaritis M, Lee R, Cerrato R, Crabtree MJ, Francis JM, Sayeed R, Ratnatunga C, Pillai R, Choudhury RP, Neubauer S and Channon KM. Systemic and vascular oxidation limits the efficacy of oral tetrahydrobiopterin treatment in patients with coronary artery disease. Circulation. 2012;125:1356-66. Antoniades C, Demosthenous M, Reilly S, Margaritis M, Zhang MH, Antonopoulos A, Marinou K, Nahar K, Jayaram R, Tousoulis D, Bakogiannis C, Sayeed R, Triantafyllou C, Koumallos N, Psarros C, Miliou A, Stefanadis C, Channon KM and Casadei B. Myocardial redox state predicts in-hospital clinical outcome after cardiac surgery effects of short-term pre-operative statin treatment. J Am Coll Cardiol. 2012;59:60-70. Lee R, Channon KM and Antoniades C. Therapeutic strategies targeting endothelial function in humans: clinical implications. Curr Vasc Pharmacol. 2012;10:77-93. Antoniades C, Cunnington C, Antonopoulos A, Neville M, Margaritis M, Demosthenous M, Bendall J, Hale A, Cerrato R, Tousoulis D, Bakogiannis C, Marinou K, Toutouza M, Vlachopoulos C, Leeson P, Stefanadis C, Karpe F and Channon KM. Induction of vascular GTP-cyclohydrolase I and endogenous tetrahydrobiopterin synthesis protect against inflammation-induced endothelial dysfunction in human atherosclerosis. Circulation. 2011;124:1860-70. Lee R, Antoniades C, Adlam D and Channon KM. Treatment of recurrent vein graft “stent-in-stent” re-stenosis guided by optical coherence tomography. Int J Cardiol. 2012;156:e20-1. Reilly SN, Jayaram R, Nahar K, Antoniades C, Verheule S, Channon KM, Alp NJ, Schotten U and Casadei B. Atrial sources of reactive oxygen species vary with the duration and substrate of atrial fibrillation: implications for the antiarrhythmic effect of statins. Circulation. 2011;124:1107-17. Adlam D, Antoniades C, Lee R, Diesch J, Shirodaria C, Taggart D, Leeson P and Channon KM. OCT characteristics of saphenous vein graft atherosclerosis. JACC Cardiovasc Imaging. 2011;4:807-9. Antoniades C, Bakogiannis C, Leeson P, Guzik TJ, Zhang MH, Tousoulis D, Antonopoulos AS, Demosthenous M, Marinou K, Hale A, Paschalis A, Psarros C, Triantafyllou C, Bendall J, Casadei B, Stefanadis C and Channon KM. Rapid, direct effects of statin treatment on arterial redox state and nitric oxide bioavailability in human atherosclerosis via tetrahydrobiopterin-mediated endothelial nitric oxide synthase coupling. Circulation. 2011;124:335-45.